Defensive lineman are in charge with controlling the line of scrimmage. Teams who control the line of scrimmage on either side of the ball typically win the game. What are gaps, techniques & alignments? Gaps are the space between the offensive lineman. Techniques are where the defensive lineman lines up across from the offensive line. Alignments are based on inside or outside leverage. Let’s look at the defensive side of the ball. How Does The Defense Control The Line Of Scrimmage? Gap control is the most common, as players are put into different alignments and they must maintain their “Gaps”. Gaps are the areas between two players that create “holes” for running backs to run through. The bigger the gap, the easier it is for a running back to run full speed through it. The defense refer to these as gaps, offense refer to these spaces as “holes”. The smaller the gap – it forces running backs to slow down or to bounce it to the outside. This is what the defense ultimately strives to do – slow the offense and make them work laterally. Typically, the offense will try to displace the defensive lineman from their position to try to create these holes. This is more common in power schemes. In zone schemes, offensive players will try to get the defensive player running and use their speed and leverage to create holes, rather than trying to overpower the defender. This is more common in today’s spread game as teams are using different outside and inside zone schemes to naturally displace defenders. Here is a fantastic visual by former vIQtory podcast guest Dub Maddox. B-Gap – The area between the Guard and Tackle (on both sides of the line). C- Gap – The area between the Tackle and Tight End ( on both sides of the line). Now that we know what the gaps are, let’s look at man control. Man control is when teams have defensive lineman play through certain lineman to control more than one gap. This is also know as “Two-Gapping”. Two-gapping requires defensive lineman to control the opposing offensive lineman, then rip off the block and make the tackle. This defensive technique is common in 3-4 Defenses, as well as 4-3 defenses that play an even front. The defensive techniques & alignments that are often played when playing man control are 0, 2, 4, and 6 techniques. Let’s learn about defensive techniques to help you better understand man and gap control. The defensive lineman’s alignment and control of the line of scrimmage is a large part in stopping the run game. Players are positioned in certain gaps and techniques to ensure they can maintain their gap integrity. Let’s take another look at the image by Dub Maddox to better understand the defensive techniques. Complimenting the chart above, below are visual references that will help you better understand the techniques. The items listed below are better explained in the vIQtory mobile app! 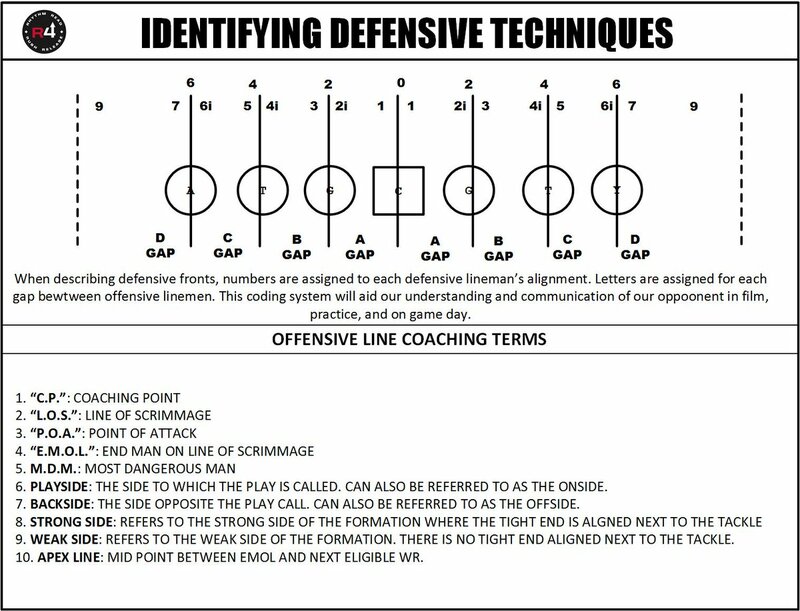 When a defensive lineman lines up directly in front of the defender, these are identified as even numbers. See the pictures below for a visual reference. Head up the Tight End is often referred to as 6! These are the “man” alignments we had mentioned earlier. Playing a defender head up makes it easier to punch them in both shoulders and be able to play 2 different gaps. Odd Number techniques identify outside alignments. This is in relation to the defensive lineman lining up on the outside shoulder. Outside alignments help players control guards, tackles and even the center from the outside. This helps players be in better position for the popular “zone” schemes that we see often. It puts players at a disadvantage to play 2 gaps but helps players control 1 gap. Inside alignments are head up numbers, but with an “i” attached to it. Very simple! Because we’re working out from the football, there is no “inside” on the center. The inside techniques start on the guard. 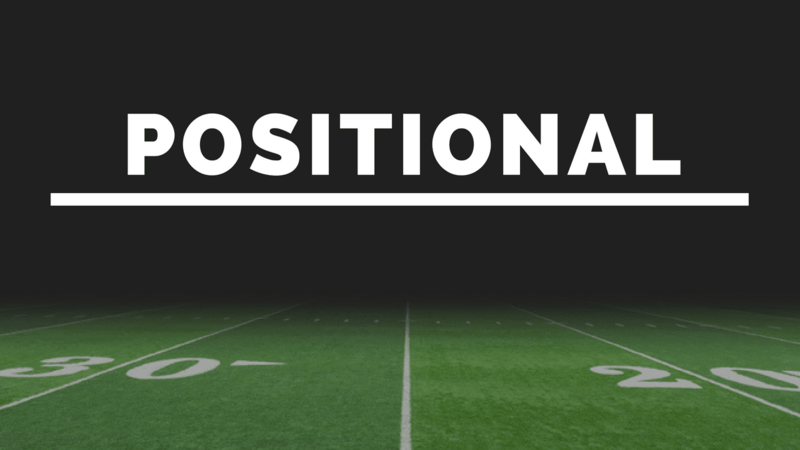 Inside alignments are often seen in 3 man fronts but can also be utilized in 4-man fronts. 4i’s and 2’s help defensive tackles and defensive ends punch the guard and tackle and control the inside gap. The over and under front are similar to each other. They both involve using a 3 technique and a 1 technique. The difference between the two, is the 3 technique in an over front is set TO the strength. In an under front, the 3 technique is set AWAY from the strength or running back. This changes the gap responsibilities for the linebackers. There’s benefits to each front, it’s all preference to each coach and how they implement them into their defense. The bear, also known as the double eagle front, utilizes 3 interior lineman. The nose is typically lined up over the center, whether that be in a 0 or 1 technique. The other 2 interior lineman are lining up over the guard, either in a 2, 2i or a 3 technique. This covers the interior lineman and typically allows linebackers to roam free in between the tackles. The 4i front is run out of the 3-4. This front has been giving spread teams trouble as it allows defenses to play aggressive to the run, but also have an extra defender in the pass game. Exactly how it sounds, the 4i front uses to interior lineman in “4i” techniques, inside shade on the tackle. The other lineman lines up head up the center in a 0. When Is Each Alignment Used? It Depends. Coaches who are bigger up front may opt to go with a 4-3 look and play gap control with their linebackers and defensive lineman. Smaller sized teams may look to go to a 3-4 and use their lineman to slant and cause confusion for the opponent’s blocking scheme. There is no right or wrong answer – every scheme fits every team and personnel differently. One thing that is common, is the alignments and defensive techniques. Coaches may create their own system of defensive line alignments, however with our research this is the most common system we’ve seen. Head up techniques are often used for teams that have a player control 2-gaps. Inside and outside shoulder techniques are for gap control schedules where a player may be responsible for one gap! Do you have a different style of calling alignments or defensive techniques? We’d love to hear them. We’re always interested in learning new coaching styles and different tactics when trying to counter the offenses run game. Want to learn more? Download our mobile app vIQtory available in the iOS and Google Play store to learn more football!